Restore Through a Tiny Pinhole! If you have sensitive teeth, most likely you have receding gums, and/or periodontal disease. According to the Journal of the American Dental Association, (Feb 2003) 88 percent of people in the United States above age 64 have one or more teeth with gum recession. 50 percent of people 18-64 years old have gum tissue recession. The presence and extent of recession increases with age. Left untreated, receding gums not only look unsightly, they can create severe sensitivity because the roots of the teeth become exposed, allowing bacteria to penetrate the roots and enter the nerves. This can lead to more painful corrective procedures such as root canals, and can cause bone loss, leading to the eventual loss of teeth. For decades, painful, traditional skin grafting was the only way to repair receded gums. If you are already seeing signs of gum recession and you’d like to do something about it but are worried that the treatment will be complicated and painful, put your mind—and your gums—at ease. In the past, the grafting procedure to treat gum tissue recession required cutting a significant piece of skin from the roof of your mouth and grafting it in place, using stitches. Because this method is invasive, it is typically only performed on a few teeth at once. 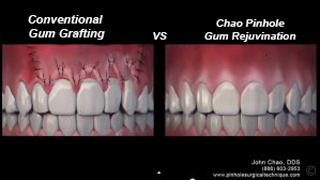 With traditional gum grafting procedures, the recovery is very painful and takes up to three weeks. So what’s new in the world of receding gums? Fortunately, thanks to a procedure called the Pinhole Surgical Technique™, years of gum recession can now be corrected on several teeth in about one hour. No cutting, no sutures, no grafting of skin from the roof of the mouth, minimal to no discomfort and no swelling. Dr. Lisa Marie Samaha of Port Warwick Dental Arts in Newport News is the first dentist in Virginia and one of the first 100 dentists in the world licensed to perform the Pinhole Technique™ for treating receding gums. The unique Pinhole Technique™ involves the use of intricately designed and patented instruments that loosen the gum tissue and glide it gently over the receded part of the tooth where it can re-anchor. The aesthetic results are instantaneous and recovery time is minimal. In fact, people who have the procedure done in the morning are capable of enjoying pain-free chewing by dinner time, says Dr. John Chao, who developed the revolutionary procedure for dentistry, and personally trained Dr. Samaha. Dr. Samaha applauds Dr. Chao for his 20 years of research and development. “The procedure is truly revolutionary and Dr. Chao is a true gift to dentistry. I am deeply grateful to have the opportunity to provide a service to my patients gum recession that replaces traditional gum grafting procedures–a process that now seems crude, in comparison,” says Samaha. The procedure is so revolutionary and effective it was published in 2012 in the prestigious International Journal of Periodontics and Restorative Dentistry, showing an identical level of success when compared to the very best of traditional techniques. The Pinhole Technique™ has been featured on dozens of prime news shows, including “The Doctors” in January 2014. The best part of the Pinhole Surgical Technique™ is that the effects are predictable, comfortable and long-lasting. With proper care and regular dental checkups, patients who have had gum recession and have had the procedure are maintaining healthy gums for years. Protect your teeth and gums and keep your smile beautiful. You’ll be amazed at how quickly this procedure can be done and even more astonished by how it can improve your dental health and overall appearance. Dr. Lisa Marie Samaha, a general dentist, is nationally recognized as a leader in comprehensive, cosmetic, periodontal and reconstructive dental care.